Of all the things that you can invest in to make your home kitchen restaurant like– you won’t find anything more versatile that ‘flour sack” towels and aprons. At several restaurants, I would have to arm wrestle the chef for a stack of flour sack towels for my bartenders and busboys at the front of the house. Cooks hoard towels, too. These things are restaurant gold. They are lint free, absorbent, dry quickly when draped over the front of a hot oven, and are bleach-able. They clean spills, polish glasses, dry hands, and make great pot holders in a pinch. In a professional kitchen, you’ll see the smart cooks with two towels tucked into their apron strings– one in front and one in back. The front towel is his pot holder and is kept dry so when he reaches for a hot pan or oven door he doesn’t get a steam burn. The towel tucked in the back waistband is for drying hands and implements. In my tiny kitchen in Los Feliz, I usually just have one towel in my apron band that I use for drying my hands and knives. I keep a stack of towels on the side, though, to replace paper towels. 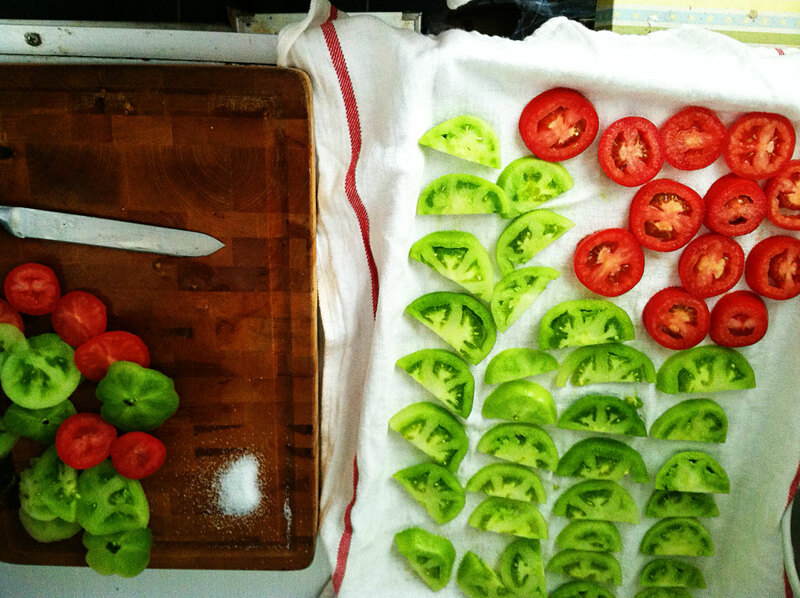 I’ll drain tomatoes or potatoes on a clean towel, rinse off the tomato gunk, then dry the towel in the oven door while they cook, clean my countertops with the towel after dinner, and then toss it in the wash. It looks charming and rustic, doesn’t it? 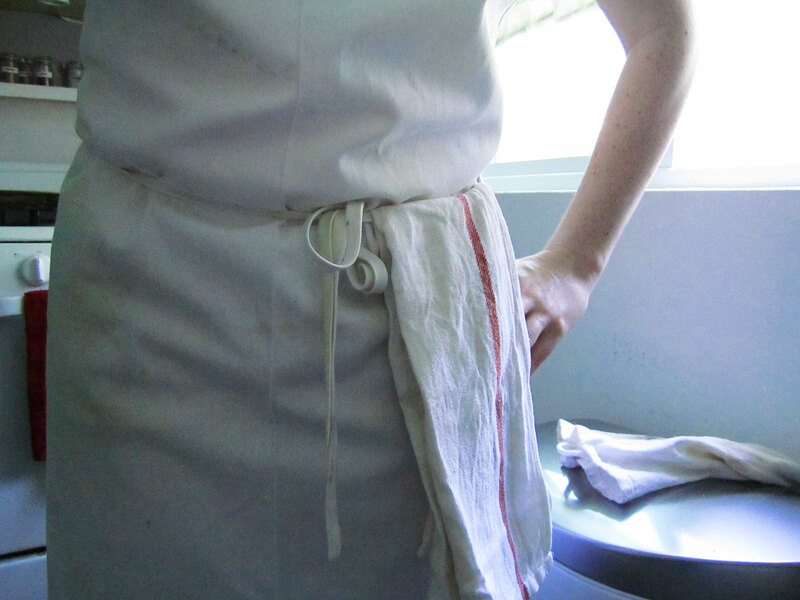 In addition to a stack of flour sack towels for your home kitchen, invest in a couple of good white cotton aprons that come down to your knees. Keep the frilly ones to toss on top of your cocktail clothes after your guests arrive for a dinner party– charming as those are, they aren’t for serious cooking. A white cotton apron can take a lot of abuse, then get tossed into the wash with a cup of bleach and all your kitchen towels. Plus, and apron that comes down to your knees protects your clothes and your legs from the heat of the oven, and also makes a handy basket to load your ingredients in when you are grabbing things from your pantry, refrigerator, and spice rack. < Previous Restaurant 101: The Kitchen opens @ 5….